(L to R) Mental Health America Director Judy Cooperberg, MHA member Harriet Johnson, and GAVAR President Roe Leer. 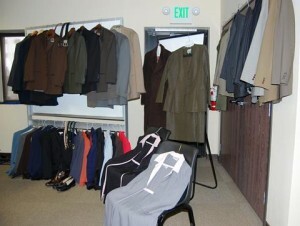 Johnson is suited for success, thanks to MHA’s Employment Clothes Closet. The Closet received more than 400 items from GAVAR and the Rotary Club of Lancaster. 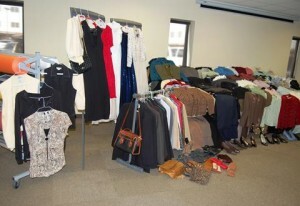 Donated items were on display at a press conference Wednesday morning. LANCASTER – Nearly-new skirt and pant suits, blazers and jackets, professional shoes and handbags were on display at a press conference at Mental Health America (MHA) in Lancaster Wednesday morning. The items were some of more than 400 articles of business wear recently donated to MHA’s Employment Clothes Closet, a program that provides MHA members with gently used or new professional attire to wear on job interviews and in the workplace. 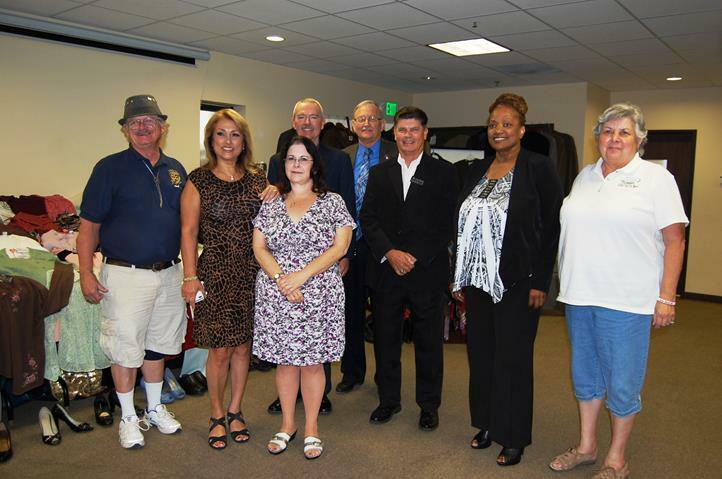 The massive, much-needed donation came courtesy of the Greater Antelope Valley Association of REALTORS® (GAVAR), with help from the Rotary Club of Lancaster and George’s Cleaners. “I’m just thrilled with the realtors, the brokers, agents, staff, affiliates, friends, spouses and clients… We feel good doing this, and we know the people who receive it will receive it in that light,” said GAVAR President Roe Leer. 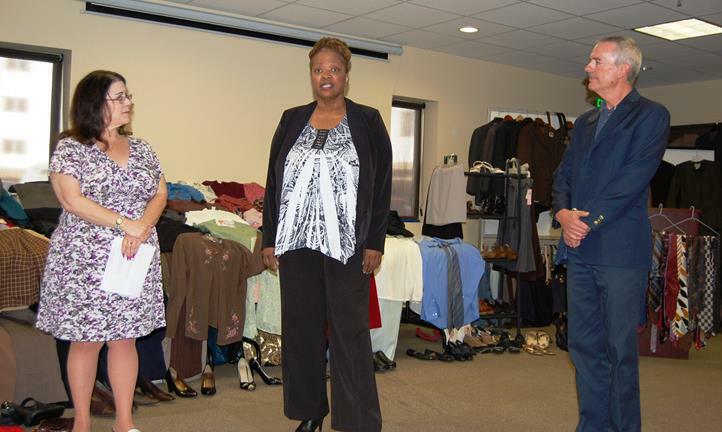 This is the second year of MHA’s “Suited for Success” clothing drive, which helps remove a tremendous barrier for MHA members who don’t have an adequate wardrobe for interviews or work, according to MHA Executive Director Judy Cooperberg. “Not only did GAVAR donate a ton of clothing, Rotary Club of Lancaster also donated a ton of clothing… and George’s Cleaners, for the second time, is a partner in this project,” Cooperberg said, adding that George’s Cleaners dry cleaned the donated clothing for free. “This project is really geared for all of our members here at MHA, whether it’s our transition-aged youth, many of which have come out of foster care, the folks who are coming through our homeless assistance program, and also our veterans,” Cooperberg continued. 6 comments for "GAVAR members help others get ‘Suited for Success’"
Yeah , of course it is how you are dressed that makes you ” worthy ” or ” eligible” for a job . I guess you wouldn’t dress up for a first date either? Dressing appropriately and professionally tells people 1) how much you value yourself and whether you take pride in yourself, which will translate into pridd in the work you do and 2) whether you have respect for the hiring manager by dressing appropriately. Lets not forgs t you only get one chance to make a first imprdssion…whether its good or not depends on your efforts. To Judy, and all involved, I would just like to say thank you. I love to read stories about people doing good things. I think it might be possible to underestimate how much good such a program creates. When GAVAR President Roe Leer said “We feel good doing this, and we know the people who receive it will receive it in that light, I get the feeling that the people receiving the help appreciate it much more than that. To have someone care enough to help you like this is priceless to someone who may have lost faith in everything. And it inspires everyone else watching who realizes how life affirming such help can be for those who need it. You all inspired me, thank you again. Thank you David. Believe me, we get back a hundred-fold by doing this “work.” I get inspired every day.